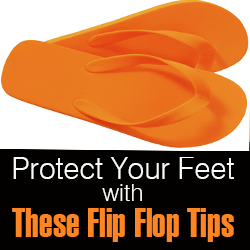 By Dr. Lowell Scott Weil, Sr.
Flip flops are no longer just for the pool! The slip-on footwear tends to be a fashion favorite, especially during the summer months. However, they have long been pegged for contributing to a variety of foot problems by not only podiatrists, but other professionals in the foot industry. Dr. Weil does not agree. In reality, however, sandals and what we call flip flops have been around for 2500 years. Egyptians made imprints in wet sand and molded papyrus into soles and attached rawhide thongs to keep them on their feet. In my travels, I found that hides used in African sandal construction were traditionally softened in cow dung, the cured between bark. Peruvians, and the people from India were amongst those that wore and continue to wear sandals that we would call flip flops and that means that a good majority of 1. 3 billion people are out there wearing sandals that have been scrutinized by many American health professionals. Several months ago, at an “all doctors meeting” of the Weil Foot & Ankle Institute, I asked our 20 podiatrists, “Have you seen many serious injuries as a result of people wearing flip flops? Everyone looked around the room and all agreed that they have seen a few foot injuries stemming from those flip flops, but not many. Rather than protest the people’s choice for flip flop fashion, sticking to a few basic guidelines will help slip-on supporters make the right footwear choices. Opt for a Cupped Heel: Rather than picking a completely flat pair, choose a slight heel (even as low as a ¼ of an inch) to elevate the heels. This will prevent strain on the Achilles tendon and lessen the chance of arch pain. Guys don’t seem to have a problem with the flat floppers, but when they do, it is usually heel pain, that is called plantar fasciitis. Avoid a Flimsy Foot Bed: If the shoe can easily be bent in half, which is usually the case with the rubber variety, it will most likely not offer very much support. Sandals with a stiffer foot bed, however, maintain their shape and keep the foot in a more secure position while walking. Wear the Right Size: Make sure the sandal fits, literally. If your foot is hanging off the edge or your heel is hitting the back, it is time to move to the next size up. If you can find a pair with a built-in arch, you are on the right track. Watch Out for Irritation: Flip flop proponents are often prone to irritation between toes, particularly where the toe thong fits. To prevent a blister, keep the area clean and use Vaseline ointment on the strap between the toes..
Don’t Try to Run in Flip Flops: Most of the injuries that we have seen as a result of flip flops are due to people running or trying to play sports in them. 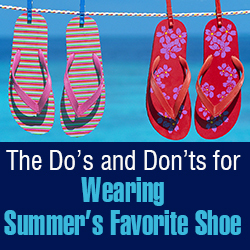 If you plan on being overly active, swap the sandals for sneakers. Remember: People have been wearing these type of sandals for over a thousand years and have survived. If you live in the upper midwest or Alaska, use you flip flops in doors ! !